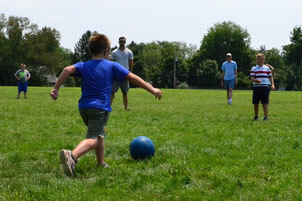 What better way to enjoy a summer Sunday afternoon than with an outdoor picnic and fun game of kickball with friends! Thanks to everyone who participated and connected in this way! Many Daybreak folks soaked up the sun following a midsummer worship service by enjoying a picnic lunch and a thrilling kickball game. The beautiful trees, playground, and green ball field in back of our meeting space served as a perfect spot for this time of recreation and connection. Everyone brought along their own lunch and circled up in the shade for an informal picnic. Then we took to the field for an entertaining game of kickball. The kids got in the action and at times made the adults looks a little silly as they dodged the ball and swiftly circled the bases! The above cannot be viewed on an iPhone nor iPad because it uses Flash player. To view the slides directly go to the Picasa Web Album .